Data centers today lack a formal system for classifying software management tools. As a result, confusion exists regarding which management systems are necessary and which are optional for secure and efficient data center operation. This paper divides the realm of data center “Operations Technology” into four distinct domains and compares the primary and secondary functions of key subsystems within these domains. 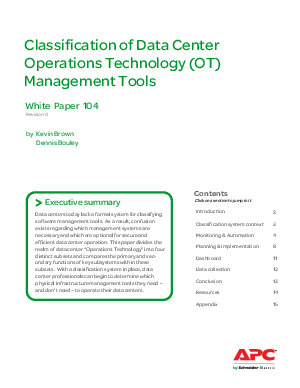 With a classification system in place, data center professionals can begin to determine what kinds physical infrastructure management tools they need – and don’t need – to operate their data centers.